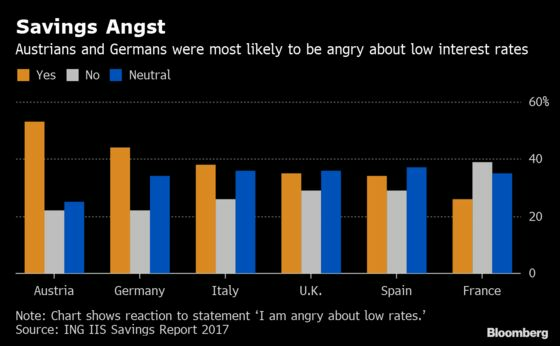 (Bloomberg) -- “Bad.” That’s what Karin Greulich, a shop assistant in the southern German town of Konstanz, thinks about low interest rates. Greulich may be in for a long wait. A slowdown in global growth is forcing central banks to put off ending easy money. The European Central Bank pushed back the time when interest rates will rise, and plans to keep them at record lows at least through the end of the year. But her frustration over low rates can be heard in millions of homes across German-speaking countries, including in Switzerland, home to the world's lowest central bank policy rate. Head south to countries such as Italy and Spain though, and people are more likely to welcome them. That’s not just because those economies are weaker — research suggests that culture and language foster different attitudes about financial risk. One such indicator is home ownership. Francesca Lozito, a 43-year-old radio broadcaster from the Milan area, said Italians tend to see real estate as a store of value to be acquired as soon as possible. 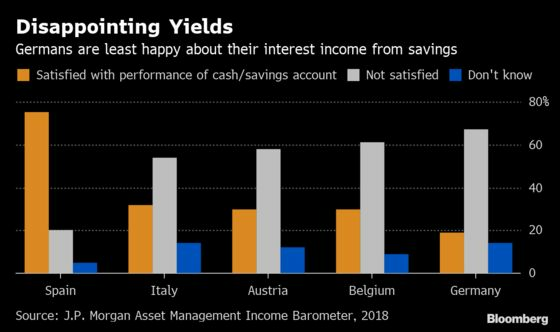 “I was concerned that interest rates might eventually start rising again so I decided to invest in an apartment here in Italy before it was too late,” she said. 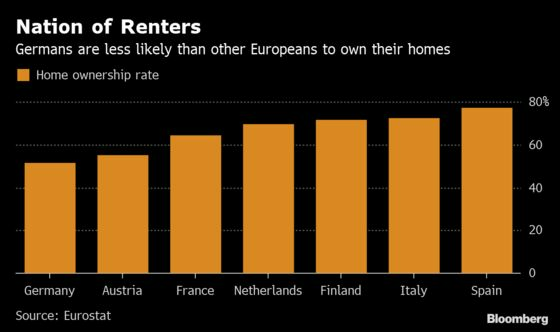 The share of homeowners in Italy is among the highest in the euro area, exceeding that in Germany by 21 percentage points. That's despite the fact that Italians earn significantly less than Germans and have to stretch farther in income terms to afford housing, according to a Deloitte analysis. 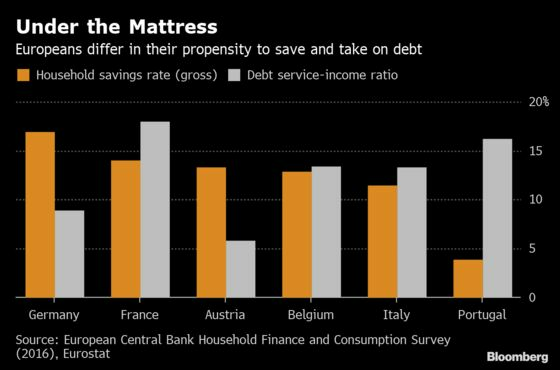 Differences in people’s savings behavior and governments’ budget policies are other gauges highlighting attitudes toward money, with some of them sparking cross-border criticism. French President Emmanuel Macron took Germany’s Angela Merkel to task for her “fetish” about surpluses last year. Germany’s monetary caution is often attributed to its history of hyperinflation in the 1920s. 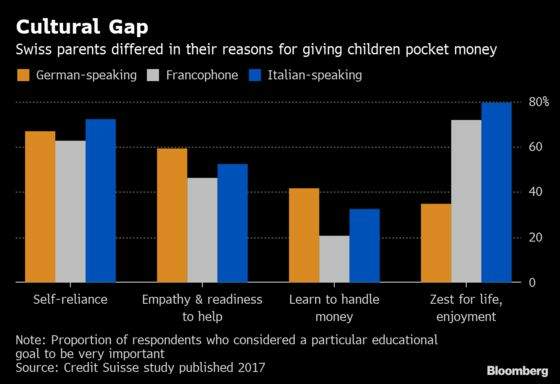 Yet Switzerland — a nation with three distinct sociolinguistic groups — highlights that the differences are due to more than passports or wealth. Adding to the evidence is a Swiss National Bank working paper by Adriel Jost. He found that being primarily a French or Italian speaker, rather than German, lessened the likelihood of a person in Switzerland being inflation-averse. “Culture is an important predictor of savings behavior,” said Berkay Ozcan, a professor at the London School of Economics, who studies such patterns among U.K. immigrants and their children. Linguistics may also play a part. Research suggests the structure of particular languages may help determine frugality, and not only because the German word for debt — “Schuld” — also means moral guilt. Still, definite answers explaining the differences are hard to come by.